Avast! Do you want to play a pirate or are you running a seafaring game? 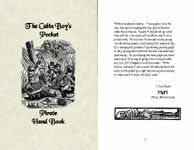 If you need to brush up on your nautical terms or learn the pirate code, then The Cabin Boy’s Pocket Pirate Handbook is for you. The Cabin Boy’s Handbook is 20 pages of seafaring facts, from sailing jargon to ship types. Add to that the 14-page role playing appendix that contains useful universal record sheets, character and campaign suggestions, and you have a truly useful guide to all things pirate. The Handbook was originally produced as a children's teaching tool for the New Jersey Renaissance Kingdom. It has been considerably expanded and become more adult in tone, although it is still an in-character guide to pirate life. The appendix takes this information and applies it to many aspect of role playing a pirate and provides appropriate record sheets.